We are delighted to have a good friend share a guest post today on charcoal grilling. Christine has made charcoal grilling her hobby for many years and knows what she's doing! She has a recipe for grilling pork shoulder posted on her personal blog which you may enjoy as well. Thanks Christine! While most people associate grilling with hamburgers and hot dogs, in the last few years the realm of grilling progressed to fine dining. In Chicago and Indianapolis, restaurants serving only food grilled over charcoal exist and entire cooking shows on the Food Network are devoted to this emerging medium. What I love most about grilling is how basic it is - coals plus protein or vegetables equals a great meal. If you’re new to grilling there are only a few essentials you need. For charcoal grills, I highly recommend a chimney starter which starts the charcoal with newspaper and coals, eliminating the need for lighter fluid which can leave an aftertaste on the food. A good spatula and a timer are all that is needed to complete your grilling kit. 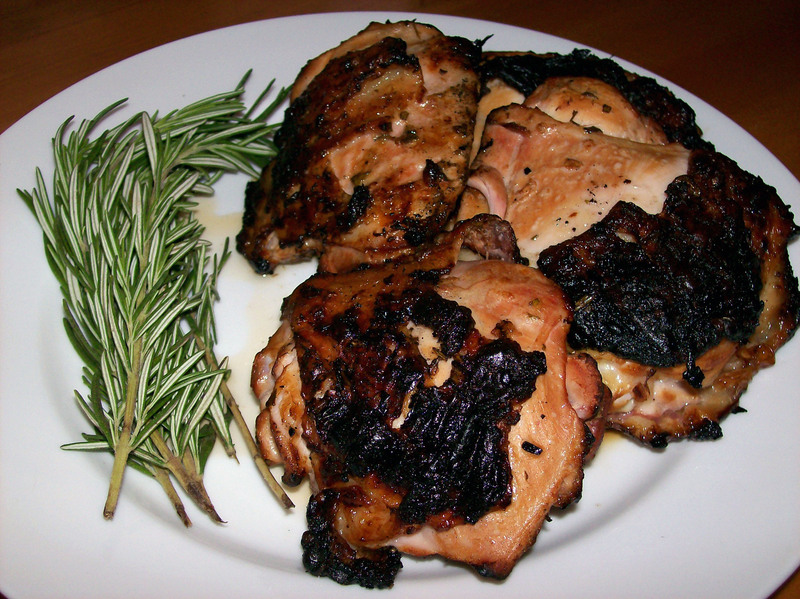 This recipe for hickory smoked herbed chicken thighs is one of my all time favorites. I’ve adapted the ingredients to feed both small and large (20+) groups of people and I think this is one of the best no fail recipes that I’ve ever cooked. Hickory chips are available at almost any store that sells grilling equipment. Be sure to buy wood chips and not wood chunks which are too large to use for this recipe, however wood chunks are easily split into 1 inch pieces with a hatchet. To make the marinade: In a medium bowl whisk together the marinade ingredients. Trim the chicken of any excess fat and place in a resealable plastic bag with the marinade. Refrigerate 6 to 8 hours. Thirty minutes prior to cooking chicken on the grill remove the chicken from the marinade and allow chicken to rest at room temperature, discard the old marinade. Prepare the grill. Soak wood chips in cold water for 30 minutes prior to grilling. Ensure that coals have ashed over then spread wood chips over coals. Put the cooking grate on the grill and allow to heat for 2 minutes while the wood chips begin to smoke. Sear the thighs skin side down over direct medium heat with the grill covered for 10 minutes (until the skin crisps), then turn the chicken over and cook 20- 25 minutes more until the chicken is no longer pink at the bone. Remove from grill and allow to rest for 5 minutes. Note: using woodchips will turn the meat a pinkish hue, this is normal when smoking.